Last week was “Sneak zucchini on your neighbor’s porch day” – and lo and behold, I got a few on my doorstep. Except none of my neighbors have gardens. It’s a complete mystery, and I appreciate the thoughtful gesture. I guess if anyone could find a use for zucchini on my block, it would be me. Though I’m hoping the kind gifter was not expecting me to make Zucchini Corn Dog. 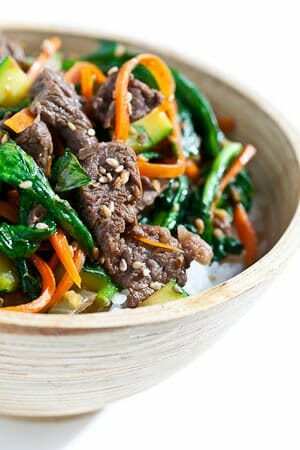 Instead, the zucchini was made into a supporting role in this one-bowl Korean Beef Rice dish. One bowl meals are awesome. That means I can set the table in 10-seconds flat (everyone gets either a pair of chopsticks, fork or spoon — pick the weapon of your choice) and just 1 bowl to clean per person. 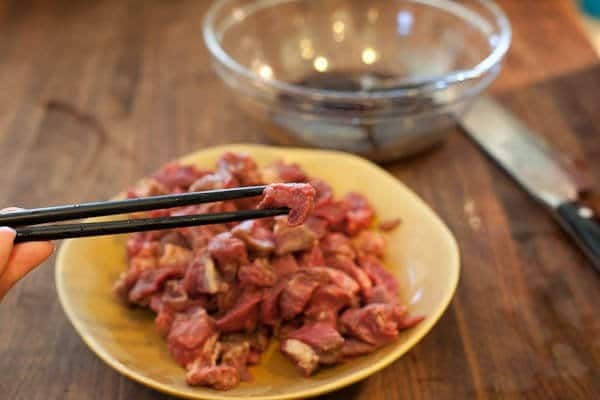 Thin slices of beef are marinated in a combo of soy, brown sugar, sesame oil, garlic and ginger – the same marinade I use for Korean bulgogi. Because the beef is thin, the vegetables are small, it’s also a 29.5 minute meal. One bowl, 29.5-minute meal that uses zucchini. 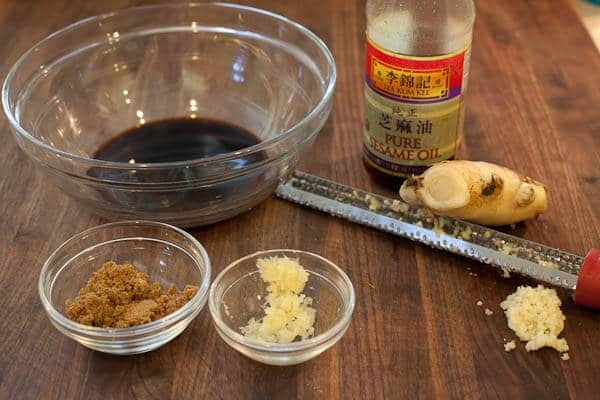 Here’s the marinade ingredients – soy sauce, sesame oil, grated ginger, garlic, brown sugar. It’s important to cut the beef very small or very thin. It’s a one-bowl meal, remember? No knives. Either cut the beef into small pieces like this. 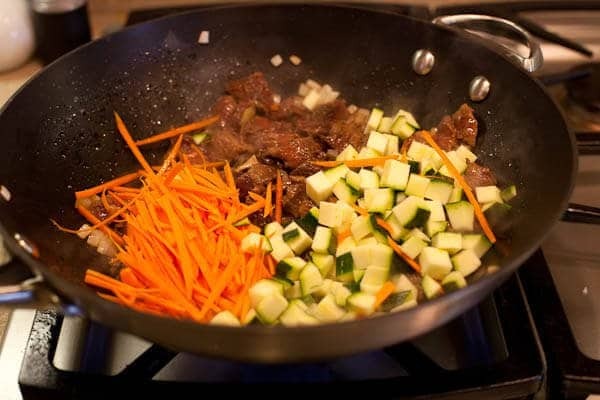 Marinate the beef while you cut the vegetables. 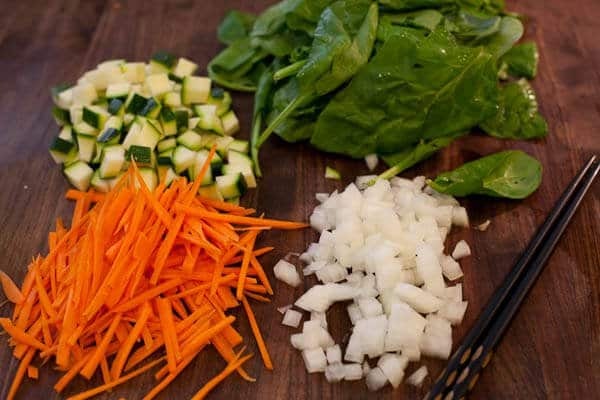 Zucchini, baby spinach, onions and carrots. Notice that the veg is also cut very small or very thin. They all gotta cook almost at the same time! Then add the beef. Stir-fry beef until just barely pink in middle. Add the carrots and the zucchini. Once spinach has wilted, the carrots softened and zucchini cooked, it’s done. Sprinkle with sesame seeds. 1. Cook the rice according to package instructions. 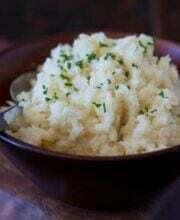 See How to Cook Perfect Rice recipe on Steamy Kitchen. If using basmati, see this recipe. 2. For the beef, if using flank steak: Cut the steak into very thin slices ACROSS the grain. 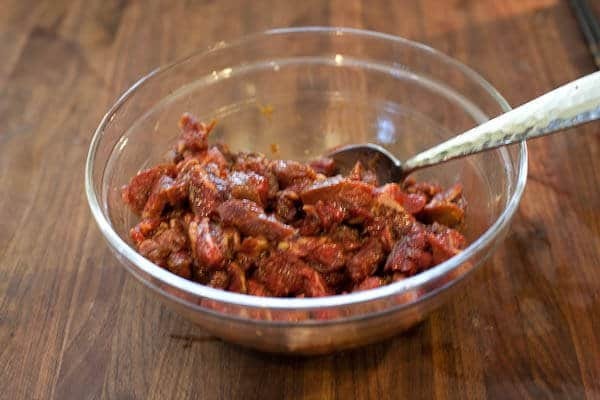 If using other steak: Cut the steak into very small cubes, about 1/2-inch. If using ground beef: leave as-is. 3. 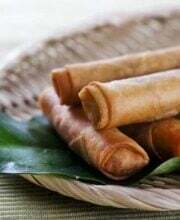 In a large bowl, combine the soy sauce, sesame oil, ginger, garlic and brown sugar. Add the beef and toss to coat. Let marinate while you prep the vegetables. Steps 1 and 2 can be done ahead of time up to 1 day before. 4. 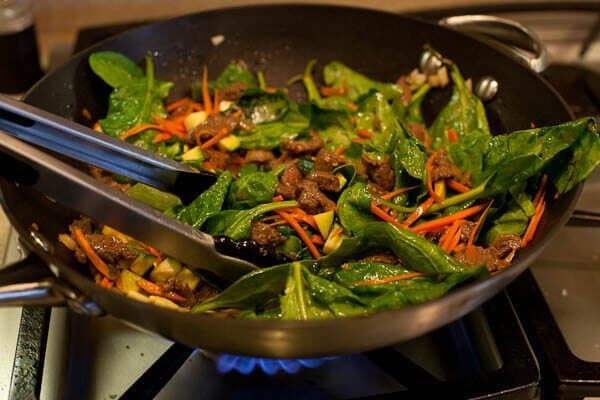 Heat a large saute pan or wok on medium heat. When hot, swirl in the oil. 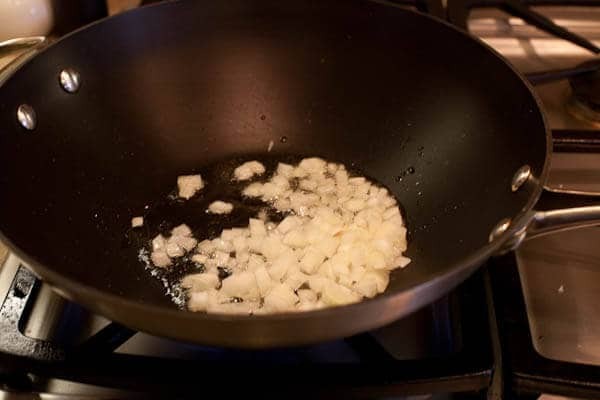 Add the onions and saute for 1 minute. Turn the heat to high and give it just a few seconds to heat up. Add in the beef, spreading the beef all over the surface of the pan, tossing with the onions. Saute for 2-3 minutes until just barely pink. 5. Add in the carrots, zucchini and toss. Cook for 1 minute. 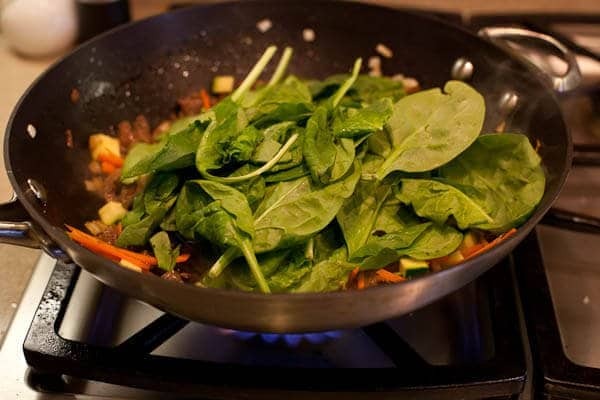 Toss in the spinach and cook for an additional minute. Sprinkle with sesame seeds. Serve with rice. Excellent quick dish. My picky family all loved it and I totally cheated using nice ground beef. Added squeeze of lime and fresh Thai basil, and spice. My beef is currently marinating! I am excited to cook this for my family! Second time to make this, Superb recipe. Don’t change a thing. Used my wife as a guinea pig the first time, then made it for friends. Everyone loved it. Following you and whatever else you will post. This recipe looks so good! Is it possible to use white sugar instead of brown sugar? Yes, you can use white sugar instead of brown sugar! This was a super simple and delicious recipe. Great with a bit of sriracha sauce as well! I made this tonight and it was a hit with my teen boys! I will double the marinade next time so there will be some as a sauce for the rice! So good. I made this tonight. Wow was it great. Living in Tokyo is somewhat an expensive experience. Found Japanese soy sesame dressing in one of the local grocery store in Minato-ku. I used that to marinate my thin sliced beef, same method and veggies that the recipe called for, add a bit ginger powder and brown sugar. Boyfriend approved! Thank you for this wonder meal. Oishii!! DELISH!! I have made this dish three times now and my family loves it. Very easy to make once everything is cut up. I made it for dinner for a group of ladies who were going on a mud run the next day. Great meal to serve for those who wanted to get their carbs and protein without going to heavy. Thanks for the recipe. It is definitely a keeper in our house. Just tried this recipe yesterday, it was delicious and won’t be the last time, i’m sure i’m going to make this again, again and again. Simple, easy and delicious. Great recipe when i don’t have much time. Agree with you, so fast. Thank you. I made this last night for dinner, minus the rice, and it was amazing. I added fish sauce to the beef marinade, but other than that I followed the recipe exactly. It was a hit!! Very very good! It’s even good cold in the middle of the night. Thanks so much for sharing this recipe! i added zucchini flowers and kimchi as condiments and color after plating. i used grass-fed chipped beef and also included radish in the vegetable medley. the final reult was something to admire. thank you for sharing the ease of wonderful food! i want to try this recipe, BUT i cant find Zucchini in our local grocery stores. Can i replace it with Cucumber? Thank you…I’ve made this twice and it’s so good. Can I leave the zucchini and sesame seeds out? I will be making this ono dish for me and Skippy Jr. thanks for the receipe Mahalo. I just made this for dinner, amazing! Thanks for sharing! I made this for dinner last night using fresh ingredients from farms along our road, including the meat, and it turned out excellent. Many thanks for such a great idea. It’s a do-again. This has become a staple, summer dish in my house. I love it! So delicious. Delicious beef .. I like it ..
Making this RIGHT NOW! I’m super lazy though…bought presliced ribeye from the Chinese market (the kind for hotpot). Hope it turns out! This looks delicious! 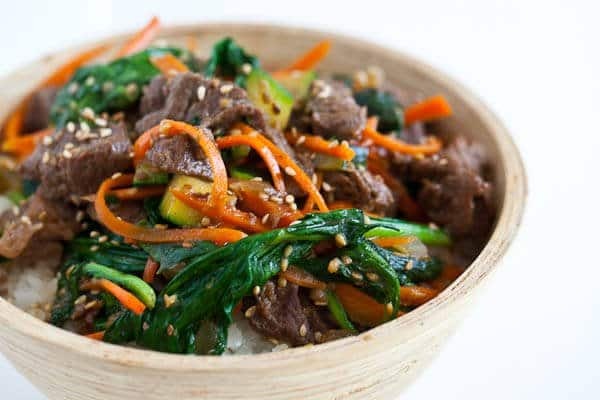 i love korean food and i am definitely goin to try this at home with some kimchi. omg now that just looks amazing. i’m totally trying this. 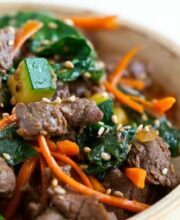 What type of beef is recommended for this recipe? I always buy the wrong cut. Flank? Sirloin? I used some left over salad and fried it in the soy sauce, sesame oil, brown sugar (plus sesame seeds). I’ll add ginger next time. I was really disappointed with this recipe. It seriously lacked flavor… maybe if I am feeling ambitious one of these days, I will figure out how to season it well. LOOKS DELICIOUS—MAKES ME WANT TO EAT BEEF AGAIN! yum! i used some ssamjung as well. next time i’ll add a fried egg on top! What are the marinade measurements/ratios? Hi Katie, the exact recipe is right there at the end of the post! I made this tonight. I marinaded the meat for 24 hours. Easy and delicious! I will definitely make this again. I am making this as we “speak.” The aromas from the marinade and the vegetables are too good to pass up! I have a happy kitchen! I made this dish this week and my husband and I loved it! It’s a perfect meal, quick, delicious and fresh-what could be better. Thanks so much! This is on my radar this week. One bowl. Delicious. Healthy. And yes, I have zucchini! Hi Jaden! I just finally made this and even though i ran out of garlic and had to use the powdered version (I know). And I ran out of soy sauce, well I forgot that when our fridge died while we were on vacation that we had to toss the soy sauce, so I used some soy sauce packets from panda express last night (double I know). Anyway, It turned out really good and I packed it for my husband for work. thanks! I couldn’t wait to try this recipe and finally made it for dinner tonight. The flavors were wonderful and I loved all the fresh veggies. My hubby wished there was more sauce to the dish because it was a little dry with all the rice. Any suggestions for a good complimentary sauce, tamari? This recipe makes me want to do a happy dance :). This is the way we eat most nights. I need to buy stock in rice…seriously. This is my type of quick dinner and I love all the flavors. Sure beats takie outie when you want a one-bowl dish and I know this one is waaay tastier than a Rachael Ray recipe (should I have said that?!). Not a zucchini lover. Sorry! Can I use brocolli instead? Sure, just pre-blanch the broccoli first, unless you are cutting them into very very small florets. that’s right! top rachael ray. what does she know about our asian dishes? i am so going to make this one, this week. definitely! Made this last night. Pretty dang good. The few minor things i changed was to add a dash of chili oil to the marinade and added some crimini muchrooms i had in the fridge. Otherwise recipe made it as documented here. The one thing i would recommend is cooking the beef in batches. If you don’t your going to be left with a pool of liquid in the bottom of the pan (like i did). I have a 16k BTU gas burner and was using a carbon steel flat bottom wok and still wasn’t enough. Other than that excellent recipe. One bowl dinners are my kind of thing too! Love this. Sneak Zucchini day cracked me up because I just came from Greg Henry’s blog where he mentioned squash blossoms showing up on his door step last week, mysteriously and anonymously. I never heard of such. Love this one, Jaden. I have a single ribeye sitting in the fridge that I was contemplating how to use. This might be perfect. Oh wow, that looks awesome! I’m a new food blogger and I just recently discovered your site (I know, where WAS I? ), and I looove it! I am stoked to try your pho, I have been dying for some lately. Love today’s recipe … as usual! I am always trying to come up with new uses for zucchini. Thank you for this recipe. It looks delicious. Jaden, and you made it in 29.5 minutes, you go now! 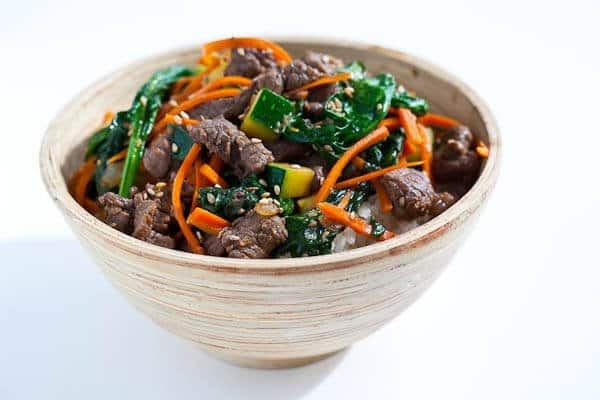 This beef and rice bowl is wonderful, I especially enjoy seeing fresh spinach in this one. This looks really good! Rachael Ray has nothing on you! Looks so simply and mouthwateringly (is that a word?) delicious. Zucchini is a nice touch. You trumped Rachael Ray in no time flat! I’ll bet your mysterious zucchini gifters are wishing they left a note so that they could be invited over for dinner. Jaden – this is a cool recipe. 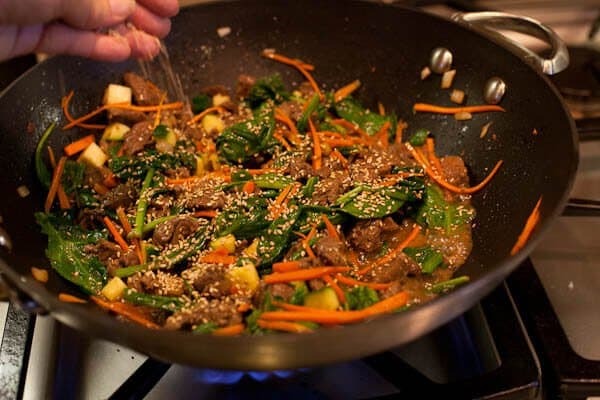 Where and what’s the brand name of your ‘wok’, looks quite functional, unlike the conventional wok, assuming it’s non-stick? 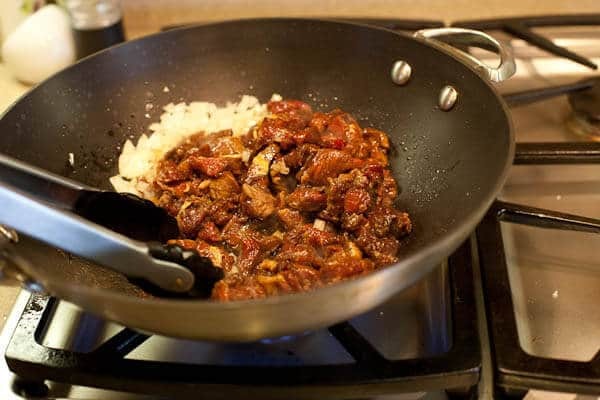 yes, it’s nonstick — I’m in love with it — it’s made by Scanpan the only nonstick pans I’ll ever use. I’ve worked w/Scanpan for several months last year. This looks amazing, Jaden! I love all of the flavors in this dish, and I can’t wait to make it for my family! sara- I have used crystallized giner. Especially since this recipe calls for weetness from brown sugar, I woudl say from my experiecne, pieces chopped up would be ok. the amount might be different though. I am so making this this weekend. Thanks! I agree with Sara, do you have to use fresh ginger? Fabulous! If you don’t have ginger, just skip it! Hey Sara – I would skip the ginger altogether than to use crystallized ginger or ginger powder. I promise, it will be just as good! I love recipes like this – it looks so good! I’ve had a wok pan for well over a year now and it still has the stickers on it! This just may be the recipe that breaks it in! That looks so good! I love that you have spinach in there too! Those pics of XMas lights in Japan on your blog are unreal!!! omg, this looks soooo good! looking at every step makes my stomach growl….loud. Zucchini is everywhere this time of year (though I haven’t found any on my doorstep yet), and this is a great way to incorporate a sometimes ho-hum vegetable into something special. My kind of fast food! Thank you for the marinade recipe. 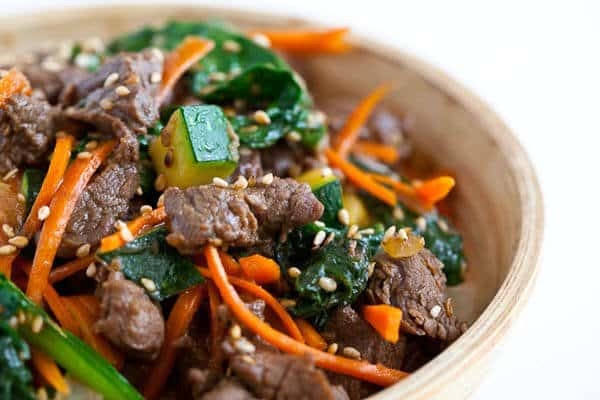 I always wanted to make Korean beef, but could never get the marinade quite right! Like the addition of the zucchini,too! OMG this looks so good and easy!! you rawk!! thanks! This recipe is awesome! Quick and easy just what we need when school is in session. Love it! I make this (bibimbap dish) all the time but I add shredded scrambled egg (or sometimes sunny side up) as a topping and we eat it with Korean hot pepper paste a bit of sesame oil over the topping. Like you, we love the convenience of simple one bowl meals too! This looks SO great!!!! I may have to make this soon. YUM! Oh, I will definitely make this one for Grumpy! This looks delicious, but I’m more intrigued with the zucchini corn dog! Have to go take a look…. I will absolutely try this recipe. Quick, easy and delicious. Love it! How nice — mystery zucchini!! 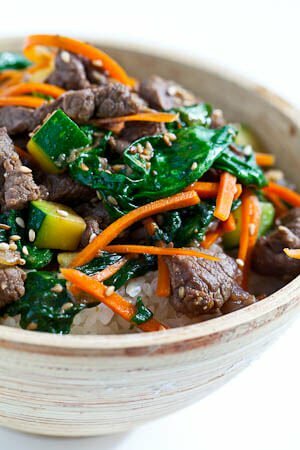 Love it 🙂 And I’d love to make a big Korean Beef Rice Bowl with it, too! That looks fantastic! I’d crack an egg on top and pretend it was some sort of fancy new bibimbap I’d invented. That looks comforting and tasty! I always seem to find ways with zucchini in my house but certainly never received any on my doorstep lol I second the one-bowl awesomeness.